My eldest sister Emma married her partner Ash on the weekend! They had a small ceremony at their local register office followed by a fancy dress barbecue and party at their local pub. Em asked me to take pictures at the ceremony (meaning I was one of the select few actually allowed in! ), so I'll do a full post on the day later in the week and gradually stick up some of the photos. My dad made them the most amazing wedding gift. Ash is a Naval Aircrewman and Emma has been obsessed with anything-ship-related since she was at university, which essentially dictated the general 'theme' of the day. My dad is a wood-working wizard, so naturally the most fitting present would be what? No, my dad did not whittle them a ship, but it could certainly be considered the next best thing. Yes, that's right, a full size ship's wheel. I knew I wanted to make them something and put a lot of thought into what would be a nice way to say 'congrats & good luck' that is as unique and unusual as they are (in the nicest way of course). I remember reading somewhere about fenghuang; the Chinese phoenix. 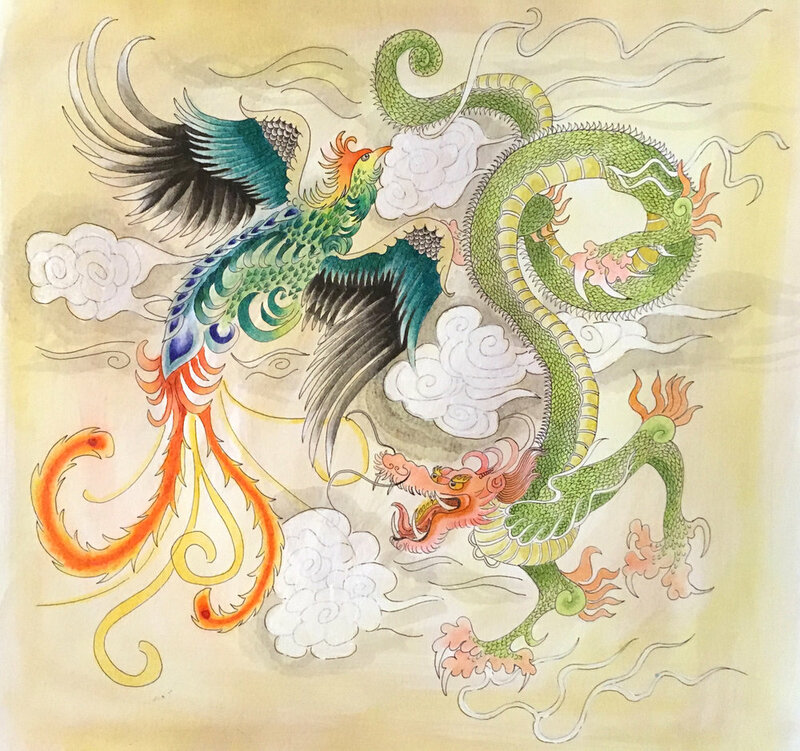 The birds are traditionally considered female and, when pictured alongside the image of the generally male Chinese dragon, symbolise a blissful and harmonious marriage. Em's appreciation for east Asian art isn't far from my own, so I figured this would be well received as an artwork, as well as a happy visual metaphor. I took some step-by-step photos of the piece, which took me several evenings to complete. This is the first thing in the style that I've attempted. After completing the initial drawing outline with a 0.1mm fineliner, I used Winsor & Newton drawing inks because these give a more vibrant colour in comparison to watercolour. Obviously I'm not completely happy with how it turned out (I'm very much looking forward to the day I am genuinely pleased with any painting I produce...); in hindsight, I'd use less intense shades for the pheonix colouring and thinner lines when doing the final brush stroke outline. Thankfully it was well received, alongside a bottle of our home-made mead and a handcrafted lovespoon (courtesy of Crefftau Ken).